Even as a massive reform of the country’s space program is under way, the fundamental question of what Russia is going to do in space remains unanswered. 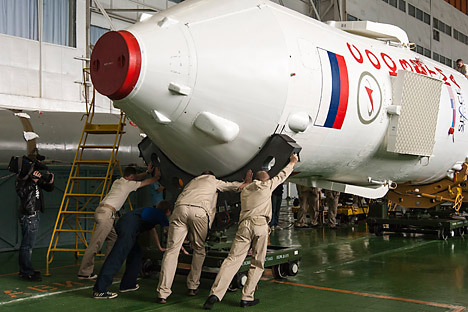 A large-scale reform of the Russian space industry has acquired new concrete dimensions. In particular, the management system of all the structures engaged in the development, manufacture and maintenance of rocket and space technology will be significantly changed. However, the fundamental question of what Russia is going to do in space remains unanswered. In mid-January, it was decided that Russian government would resolve the issue of distribution of powers of the Federal Space Agency (Roscosmos) and the creating of the Joint Rocket and Space Corporation (JRSC). From the wordings of the December presidential decree on establishing this organization, the JRSC will focus on “providing the development, production, testing, supply, modernization, implementation, operation maintenance, warranty and service maintenance, repair of military, dual-purpose, scientific and socio-economic aerospace equipment in the interests of state and other customers, including foreign ones.” In addition, the corporation is entrusted with the responsibility of conducting a unified technical policy in creating modern space equipment. Roscosmos, in turn, will determine the state policy in the aerospace industry and act as a customer. The large-scale reform of the aerospace industry and personnel reshuffle in Roscosmos began after Deputy Prime Minister Dmitry Rogozin, supervising the defence and space sector, pointed out the lack of a coherent development policy in the former management of the Agency in July last year, commenting on the latest launch vehicle accident. Meanwhile, the lack of clear management of companies in the sector, a weak material and technical infrastructure, are not insurmountable problems in Russian cosmonautics. These problems can be tackled if priority is given to questions not involving the management of the companies, their number, and the distribution of powers, but to the question of the purpose of space equipment. In other words, why do we need rockets and satellites? The apparent banality of this question, in itself, does not mean that there is an answer to it. At the end of 2013, Roscosmos announced that it was willing to pay 883 million roubles to the person or entity that would develop a framework for Russia’s space activities. The relevant order appeared on the Government procurement website. Under its terms, the “framework documents” should be developed “on the basis of systematic studies of the problems of space research and exploration in the country and abroad for the period up to 2030.” The contest to submit such a concept will end on February 13. Apparently, they were not that frightened at Roscosmos. In any case, the search for the “meaning of life” was reduced to personnel reshuffles. Even today, establishing the JRSC is, on the whole, more like a big shift of officials. As for the direct task of working in space, the scale of the plans, painted in broad strokes, is intriguing. We can see the creation of new varied equipment – both manned and automatic, the development of all kinds of technologies, the expansion of “space-based services”. In addition, of course, we can see flights to the Moon, the deployment of stations on Mars, research flights to Venus and Jupiter. However, apparently fearing a repetition of the accident involving the Phobos-Grunt probe, the heads of space agencies decided to close 15 programs involving research of planets in our solar system. Very soon, it will be known what heights can be reached by Russian space thought, when “collective intelligence” joins in the work on pressing concerns.